In December we published a report on female wealth creation, alongside our partners Wealthmonitor and Clearview Financial Media. I was particularly interested to see that the research showed not just that gender was important to segmentation, but that end clients feel it is substantially more important than their advisors do, on average. The following excerpt outlines exactly how and why the wealth holders and wealth managers feel differently about gender. “Gender politics can be complex. However, most would agree that equality does not necessarily entail a complete elision of differences between the sexes. While there is certainly no place for determinism or reductionism in the industry’s thinking, our experts agreed it should not aspire to be gender-blind – lest the traits, tastes and life trajectories that can be proven to be common to a great many women are neglected. “For their part, both the wealth-holders and advisors surveyed for this study seem to overwhelmingly agree that taking account of gender is vital to understanding the wants and needs of clients. Overall, approaching two-thirds think this should be taken into account by wealth managers, while 34% see it as being of the utmost importance to an intelligent segmentation strategy. “However, setting the views of advisors against clients themselves seems to highlight a huge disconnect. 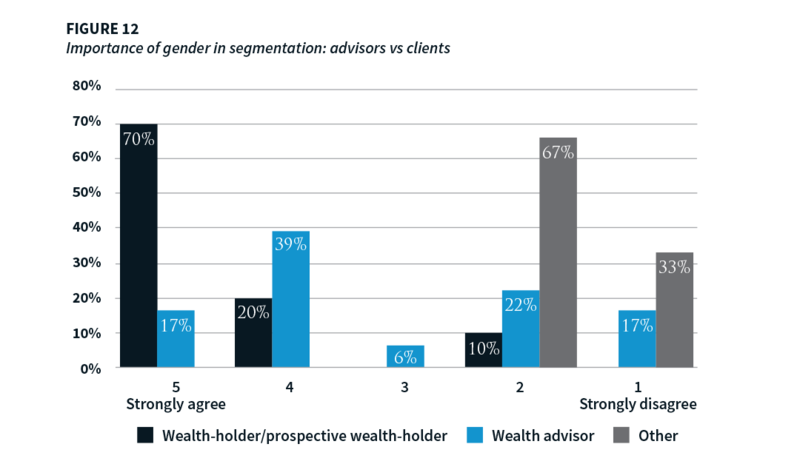 Strikingly, a massive seven in ten wealth holders believe very strongly that gender should be a primary segmentation factor, against only 17% of advisors. “Commensurate polarisation is seen at the other end of the spectrum: although 39% of advisors disagree with the principle of segmenting clients on the basis of gender, only 10% of wealth-holders do. “Wealth management professionals are right to be wary of blunt (or even patronising) segmentation techniques. It must also be conceded that there may be as much variation intra-segment as inter-segment when such broad categorisations as gender are used. But while over-reliance and generalisation are unwise, it seems that clients are in fact generally quite keen to be viewed at least partially through the lens of their gender – and research shows that the vast majority of firms today simply do not. “According to EY, wealth managers consistently see gender as the least important source of client differentiation, with just 5% seeing it as a key driver of segmentation practices (even “other” factors ranked higher). Meanwhile, Boston Consulting Group puts gender segmentation even lower, finding that only 2% of wealth managers treat female clients as a distinct client segment and have adapted their service offering to them. “However, this must also be seen in the context of the fact that, in general, the wealth management industry is hugely lagging others in the adoption of sophisticated segmentation strategies (and therefore leveraging off them to implement precisely targeted marketing techniques). For example, WealthBriefing research carried out just last year found that a quarter of UK wealth managers are still not formally segmenting clients at all, while those that do are relying on the bare metrics of investible assets and revenue generated. This blog is an excerpt from Section 3 of the report Winning Women: Key Insights for Wealth Firms Targeting Today’s Dynamic Female Clients, a 36-page study of the role women play in wealth generation globally and how firms need to adapt to support them. For further detail on how firms should be using gender as part of their segmentation strategy and why many female clients feel misunderstood, download the full report using the link below. Sarah is an Associate Director of Boston group and is responsible for a number of key clients as well as oversight of our administration teams. Sarah brings extensive experience in the banking and finance industry, having spent just under three decades with Barclays Private Bank and Trust as well as another Isle of Man based corporate services provider. The Isle of Man – still a top tier location for the eGaming industry? Boston Limited is licensed by the Isle of Man Financial Services Authority. Boston Trust Limited is licensed by the Malta Financial Services Authority to provide trust and fiduciary services in terms of the Trusts and Trustees Act.